Many nights in high school, in the suburbs of Chicago, I found myself with nothing to do late at night but go for a drive. Going westward only led to more cornfields and therefore more solitude. I would turn on some music and drive. My imagination wandered and I thought about the possibility of driving through the whole night until dawn broke the deep blue of the horizon. This feeling of freedom and possibility, given by the simple beauty of a drivers license, is something that many people can resonate with. Who hasn’t imagined dropping everything for a whimsical adventure to parts unknown? This is the emotion behind Midnight Road Trip. 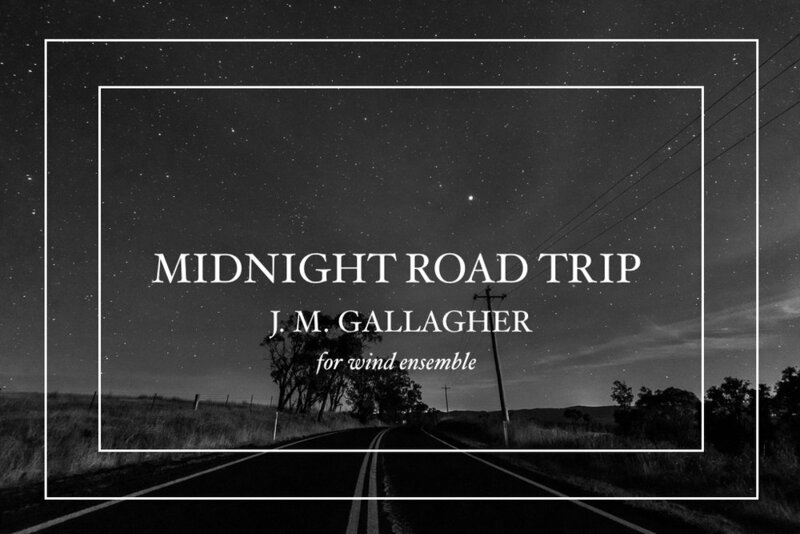 Using a combination of Jazz sonorities, pulsing textures, and liberal use of saxophones, the piece goes on a journey through the mind, cornfields, and perhaps even time. There is a coolness and airiness that wind instruments can achieve when paired with metallic percussion instruments, such as cymbals, hi-hat, and vibraphone. The piece exudes cool night air passing over the driver of a car going to unknown places. This is an imagined journey and one that goes wherever the listener’s mind chooses.